Have a look at this graph. 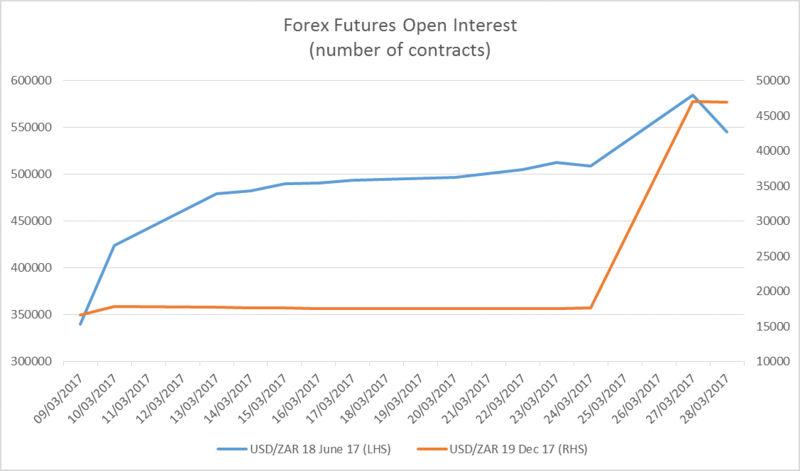 It shows the number of two different foreign exchange futures contracts that are open on the JSE at the end of every day. It shows clearly that there was a leap on Monday 27 March in both the June 2017 and December 2017 contracts (I’ll get to the technicalities of these in a moment, but stay with me while I explain the big point). At approximately 10h30 on Monday morning, SA time, news broke that president Jacob Zuma had “recalled” Pravin Gordhan from a road show in London where he was pitching South Africa’s capital markets to international investors. That led to an immediate and sharp fall in the rand, for reasons I explain here. Could one profit if you knew of such an event in advance? The answer is clearly yes. One simple way to do so would be to buy those futures on the JSE. Each USD/ZAR contract has a nominal value of $1000, though they are highly leveraged so you only need to put down a small fraction of that to get the exposure. And it looks from the figures that on Monday a large exposure was obtained using two futures contracts. The graph indicates there was a 15% increase in the number of June contracts and a 167% increase in the number of December contracts on Monday. The maths is a little complicated, but it works like this. You buy futures which gives you long exposure to the US dollar. Then if the dollar appreciates relative to the rand, you get to keep the difference. Monday’s increase was of 105 000 contracts. Those have a nominal value of $105m. The margin the investor would have to put down, basically a deposit to cover potential losses on the exposure, would be approximately R400 per contract, so the investor would have had to put R42m in cash up front, so about a 30th of the exposure. The value of the rand fell from 12.4334 on Friday night to 13.1351 as of the time of writing. Because the holder of the position is sitting with dollars, a weaker rand means they’ve made a profit in rand. Assuming the full difference in contracts was the exposure, and it has been held until now, the current paper profit would be R73.8m. That’s a pretty good return on R42m of cash in just a day or two. This assumes that the contracts were opened before the Gordhan news broke. There is circumstantial evidence supporting the view that it was before the news. For one thing, the volume in the June contract, where most of the action was, spiked early on Monday morning. 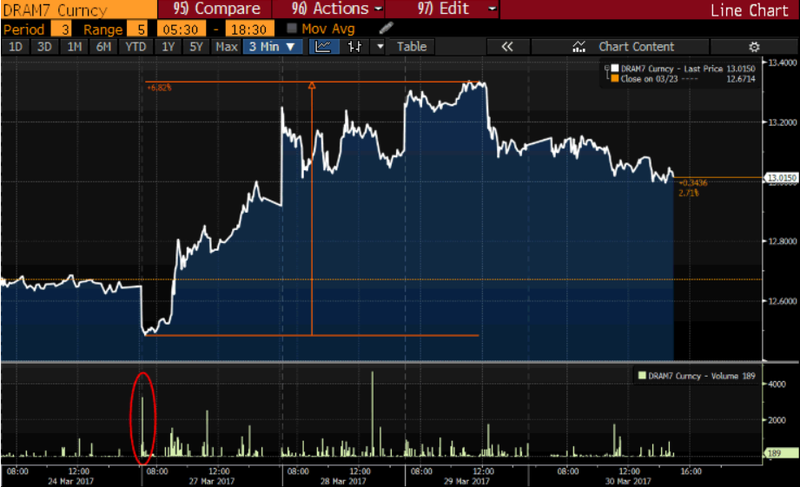 You can see that in the Bloomberg screen grab below, in the red circle (the top of the graph is the price of the contract, so you can see how whoever did that trade got in at the bottom). There is also a lot of action around 10.30 when the news broke and a large sale on Tuesday afternoon. Unfortunately, there is no intra-day data on the open interest on Bloomberg, though I expect the JSE will have that data, and a whole lot more. The movements in open interest were in those two contracts specifically – there was no similar movement in other dated contracts or in contracts involving other currencies like the pound. If this was a general post-news market movement, I would expect contracts at all dates and all currencies to move. This is all circumstantial, but there is proper evidence out there. The broker that was used, and the clearing brokers who would have handled the trade, one of Rand Merchant Bank, Absa or Standard Bank, would also have the Fica information on just who was behind it. These are all protected by client confidentiality, etc, but the point is that if someone was front running the president’s announcement, someone knows about it. It is not clear whether there are any clear laws that would have been violated. It is obviously highly unethical, as it basically profits from someone else’s ignorance in that you have information they don’t. And lets not even ponder the political implications of a politician giving information to people prior to major market-moving announcements. But insider trading rules are currently focused on company shares rather than foreign exchange.This was technically a derivative being traded on the JSE, so it may be covered by insider trading rules for that reason, but if its just treated as a currency exposure, there may be a gap in the regulations through which these traders could slip. Either way, using JSE-listed instruments was a pretty dumb move. A trader wanting to profit from such advance knowledge would be better able to do it offshore, where it is much harder to see big movements in market exposures. You can also get much more leverage. Someone trading in this way out of, say, Dubai, would be almost impossible to detect.